I have been thinking about doing this project for a while. There has been a few beginners that have signed on to the site so I thought maybe now is as good a time as any. What I want this build log to be is a step by step instruction in how to build a simple first ship in bottle. This isn't to say don't comment or ask questions. Please ask lots of questions or give input. I want others to learn a lot from this log. Part of the purpose for creating this log is the lack of good kits out there. There are some kits that create beautiful models but they are difficult for beginners. Theres others that are good to learn on but they make ships that look childish. I wanted to make something in the middle. Simple for beginners but not childish. 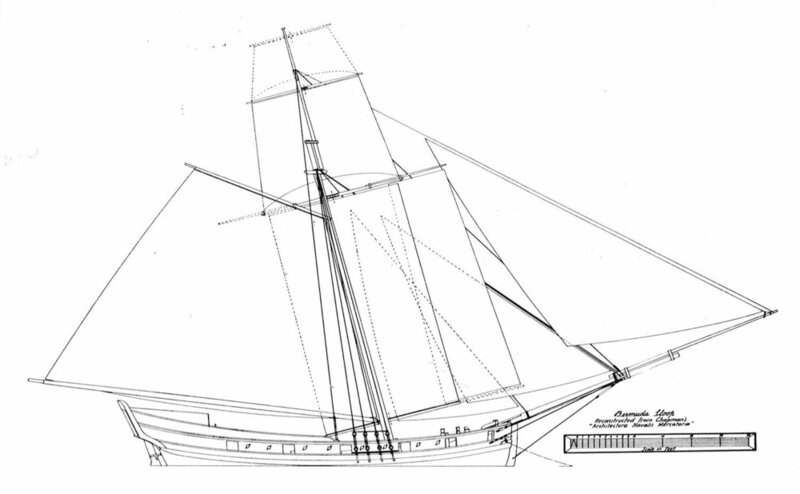 For this project I chose the Burmuda Sloop. It is simple in that it has one mast but as far as ships go this one has great lines and makes for a beautiful ship. I eagerly await reading about you building this. I was thinking of getting started with a one masted cutter, so this probably would have a lot of good information in it for me. The first place to start in building a ship in bottle is the bottle itself. For this build I'm using a clear bottle. I wanted to pick a bottle that people would have easy access to or at the very least was a common shape and size. I found this particular one at Hobby Lobby for around $8. If you get one from Hobby Lobby I suggest you go in person. The clarity of the glass differs so you will want to inspect it before you purchase it. Clarity is important in a ship in bottle. 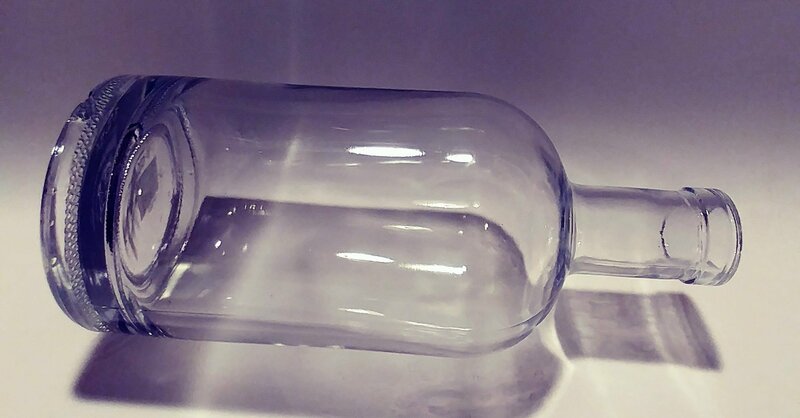 You want to be able to see the model once it's in the bottle. To many distortions or bubbles can block or distort the view. The next step is sizing the plans. For this I copy my rigging plan to a software that will allow it to be resized. Personally I use Microsoft Word. It's easy to put things in and prints the same size consistently. Photoshop might work. You might try Pixlr which is a free online photo editing software. I think Google docs would work as well. What you need though is a program that will allow you to print a photo at variable sizes. I copied the photo into word twice and gave each photo two different sizes. One a little larger and one a little smaller but both about the size of what I think will fit in the bottle. I adjusted the paper to landscape and moved the photo's to the left side of the page. Then I cut out the plans with a long narrow strip going to the end of the page. What this does is allows me to put the plans into the bottle with the narrow strip sticking out. This narrow strip helps pull the plans out of the bottle. Cut the plans to the water line and to the top of that mast and close to the back of the ship. That way you can see if the ship will fit in the bottle. This is the smaller of the two plans. It turned out to be a bit to small. 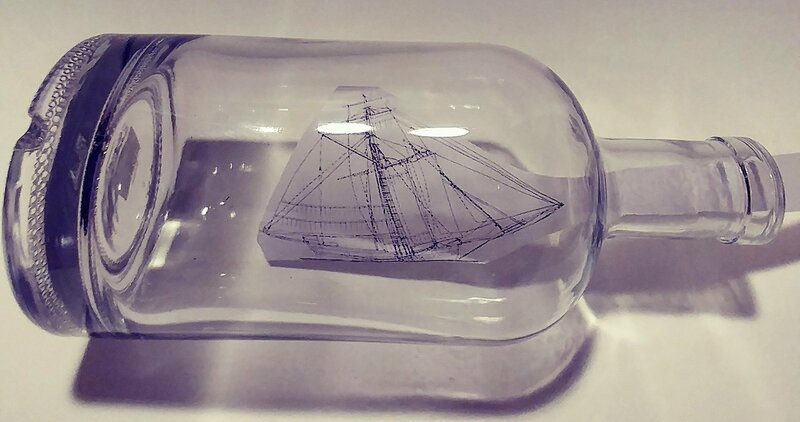 I pulled it toward the front of the bottle to point out the different aspects of sizing a ship in bottle. To get philosophical I personally think ship in bottle building is part modeling and part painting a picture. The bottle is the canvass that this painting will be on. When someone paints a picture they don't paint on one side of the canvass and leave the other side blank. They fill up the canvas. One aspect of a good ship in bottle is one that fills up the bottle. With the bottle laying down I will mostly be worrying about the height of the ship. The closer I can get the mast to the top of the bottle the more space the length of the ship will fill up. Going back to these particular plans notice that the ship will easily fit in this bottle but, there is a lot of extra space. I pulled the ship forward to point out that about a third of the bottle is empty. I have plenty of room to go up so I will need to make the plans bigger. Technically I could add a lighthouse or another ship to fill in that space. For this build though I'm just doing the ship. The bigger of the two plans has the opposite problem. The plans are too big. You can see the top mast curling around the top of the bottle. Notice lengthwise this ship really fills up the bottle. The trick is getting height length and width to work. There's another part to be careful about in sizing and it's a mistake I've made several times. Be mindful that you will also put sea into this bottle. I have carefully sized ships and got them to fit just perfectly but forgot to add a few millimeters for the sea and ended up with a ship that doesn't quiet fit. Every millimeter counts! Add a few for the sea going into the bottle. I did a final resize and got the height right where I want it. I've accounted for the sea and left some room and the ship is filling up the bottle nicely. I did pull this forward as well to show the difference. The ship leaves about a fourth of the bottle empty. When it's centered it will be an eighth on each side which is pretty nominal. I put my other plans on word and adjusted them to the same size as my rigging plan. I then checked the width. 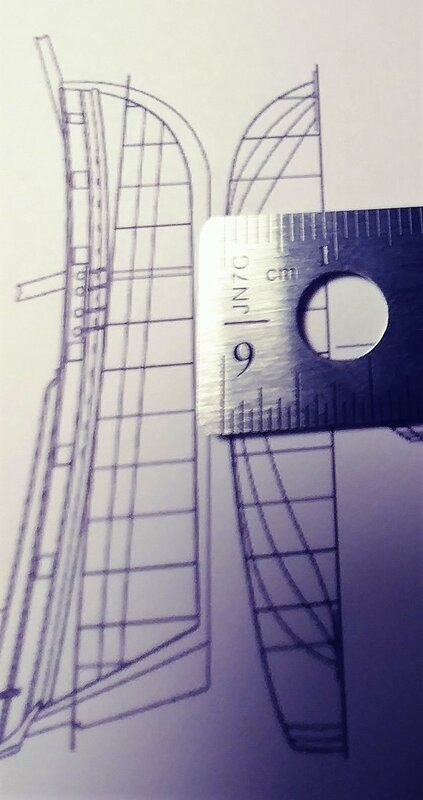 The width of the plans is 9 cm. This is of coarse half the width of the hull. 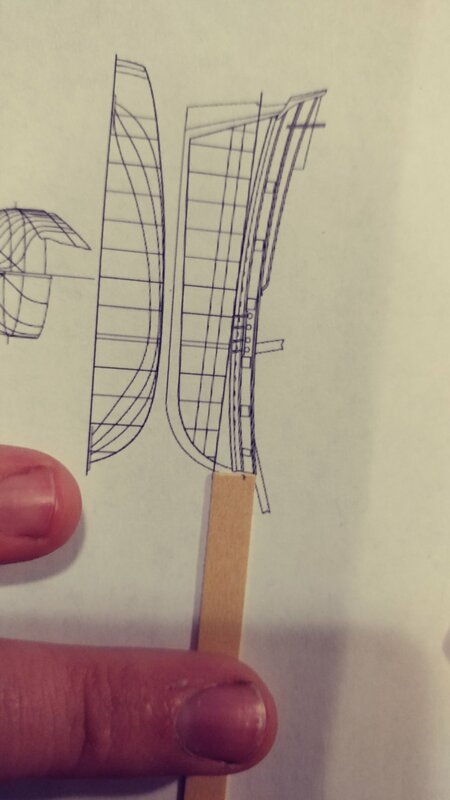 So the hull width will be 1.8 cm. 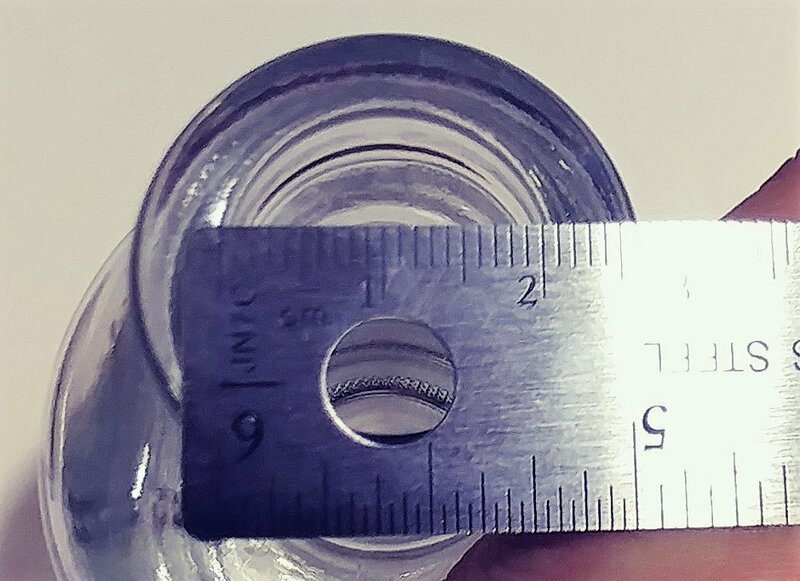 The bottle opening is 2 cm. I have 2 mm to spare. 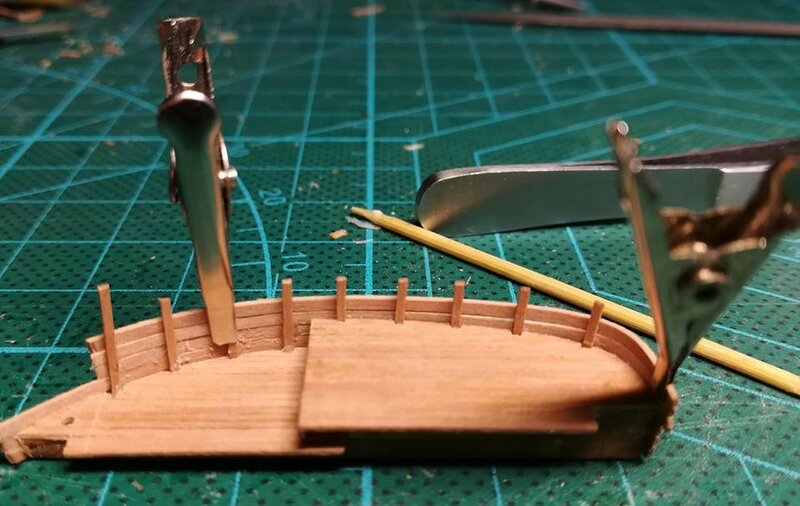 I will need these additional millimeters because the cannons will protrude from the side of the hull. A long with that the main sail will need to wrap around the ship so I will need some space for the sail. 2 mm will be enough space for that cannons and the sail though so size of the plans are good to go. I then printed a few copies. I will be cutting them so I'll need more than one. I did pick this bottle specifically because I think it's a good beginner bottle. The standard U.S. size bottle opening is 1/2 an inch or 1.27 centimeters. 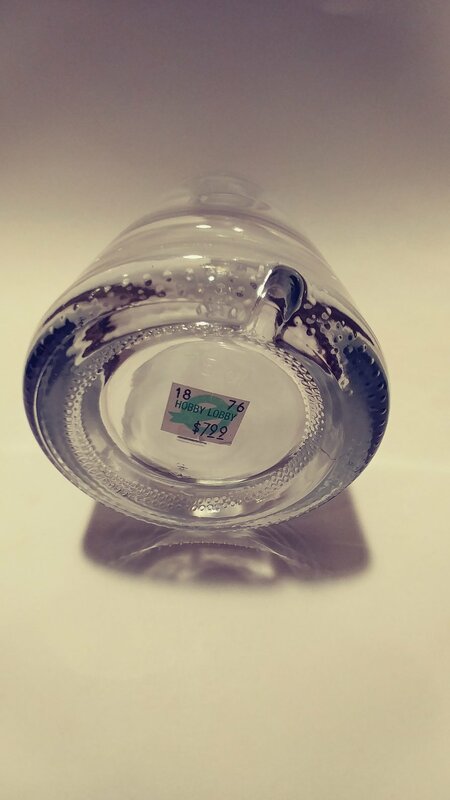 This bottle has about a 3/4 inch opening or 2 cm making it slightly wider than standard bottles.It's not so wide as to take away from the magic of putting the ship into the bottle though. The next step will be carving the hull. Let me know f you have any questions so far. MS Powerpoint is useful for shrinking/growing scans or photos. It has a facility where you can turn a colour transparent (eg, the white background of a page) so that one can be superimposed on another if need be. Also the drawing package is usable and you can get good results with a bit of practice. Although we are officially metric, a lot of people (especially us older ones) still talk in 'real' measures like pints and feet and inches from the good old imperial system, and end up being bilingual in weights and measures. Where did you get the picture that is in the bottle? The one that is of different sizes. 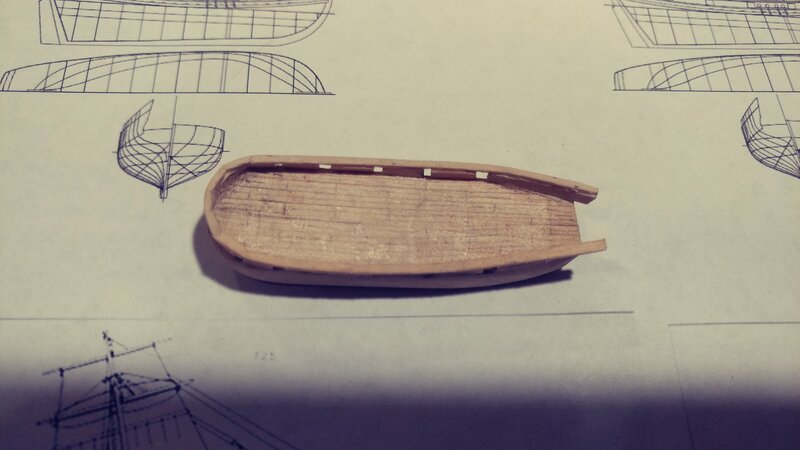 Now I get into carving out the hull. 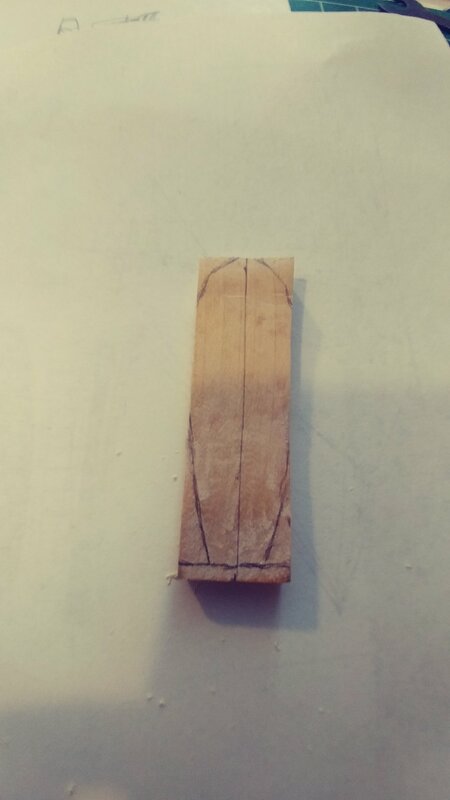 First I start with the wood. I always talk about how inexpensive this craft is and this instance is no different. 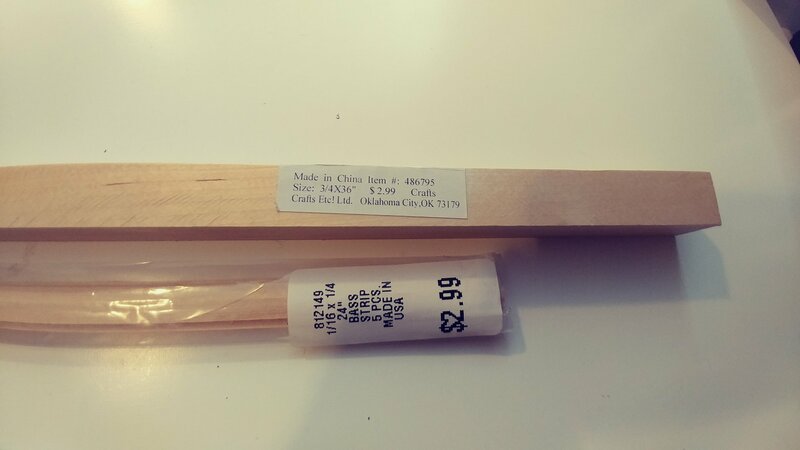 I went to hobby lobby and picked up some bass wood. In case you are wondering I am not sponsored by hobby lobby and this isn't ads for them. They just happen to be the closest hobby store to my location. Although if some one from hobby lobby reads this and feels like sponsoring a cool website that promotes ships in bottles....message me. Any way here's the prices for what I got. Honestly for $6 I can build twenty Bermuda sloops. Supplies go a long way in ship in bottle building. From here it's cutting out the size block I need. I compare the wood to the plans and make a cut. Then I cut the deck angle. This is something I think I do a little different. A lot of builders will carve the hull from a solid block. I actually love that method because it's a lot of fun. 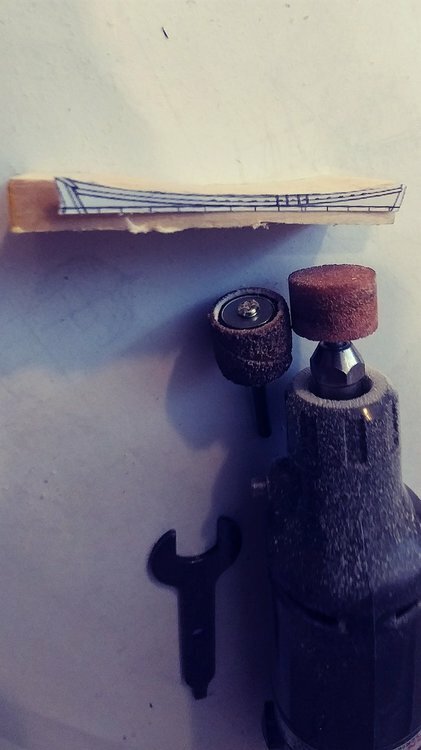 I do find this method to be a little easier though so I'm including it in the beginners build. 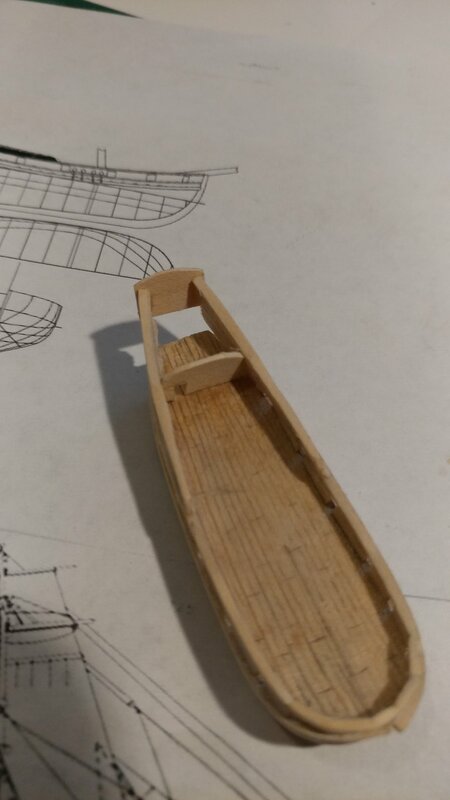 First I cut out the plans at the water line and the deck line. For the deck line I use the bottom of the gun ports. Carving out the deck this way helps keep that nice curve the ship has. The cut out plans will be used to carve this out. The bulwarks will be glued on later. 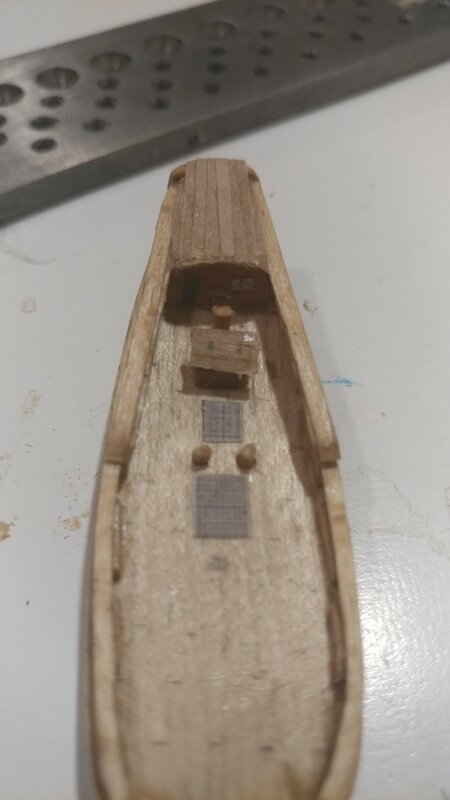 The hull will actually be pretty thin so I cut the wood down and then wen to my dremel for the curved cut of the deck. I've included the two tools I use. One is fast and the other smooths it out I then follow it up with hand sanding. I left a little under the water line since the ship will be embedded in the clay sea. Note. I made my length cut a bit long. Better to long than to short. From here I cut out the over head plans. 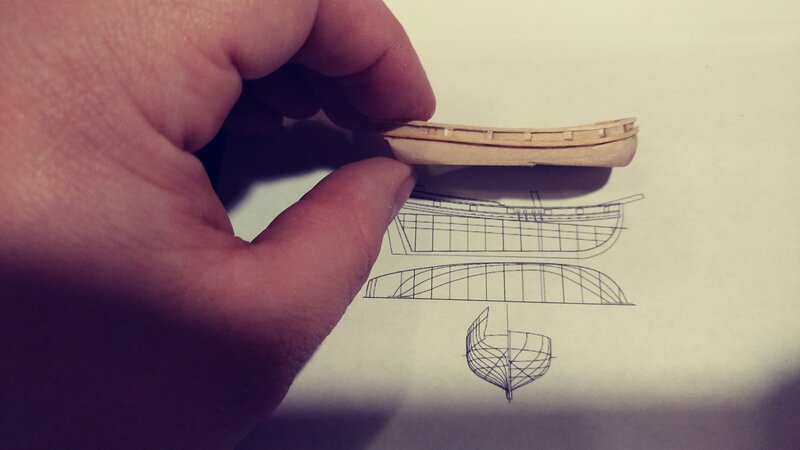 I drew out the center line then drew out the hull shape based on the plans and made my cut. Something to note here. For ships that have a big tumble home you will need to account for it before you cut out the overhead plan. The deck may not be as wide as the hull itself. The Bermuda Sloop doesn't really have a tumble home so this isn't a problem. 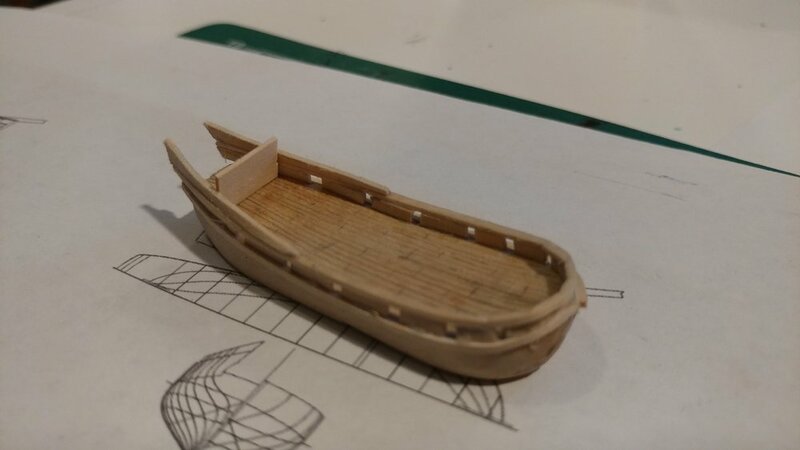 We will need to account for some slight tapering in the stern section but this will be done with the bulwarks and deck house later. Then comes the more intricate sanding out of the hull. 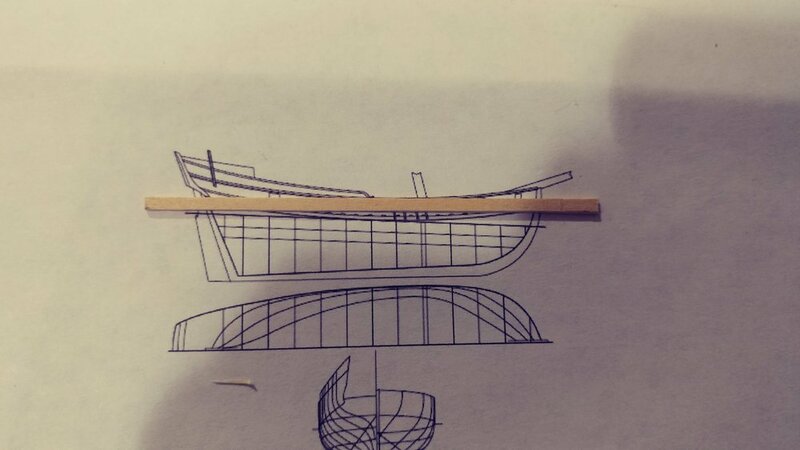 Compare the hull to the plans and sand it out accordingly. 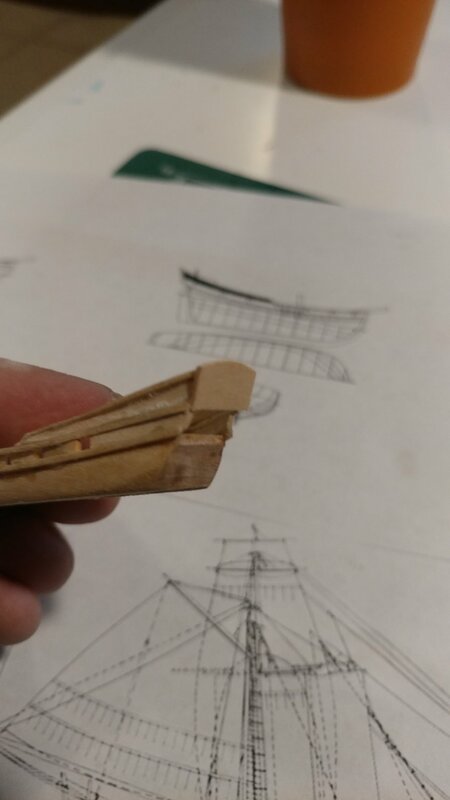 Note the way the stern and bow tapers inward as you go down the plans. This needs to be replicated in the hull. The hull in this photo appears long for some reason. Weird angle I guess. Also note how the stern tapers inward when facing the back of the ship. Sand those corners in. I had a hard time getting a picture to show this. I hope this is good enough. 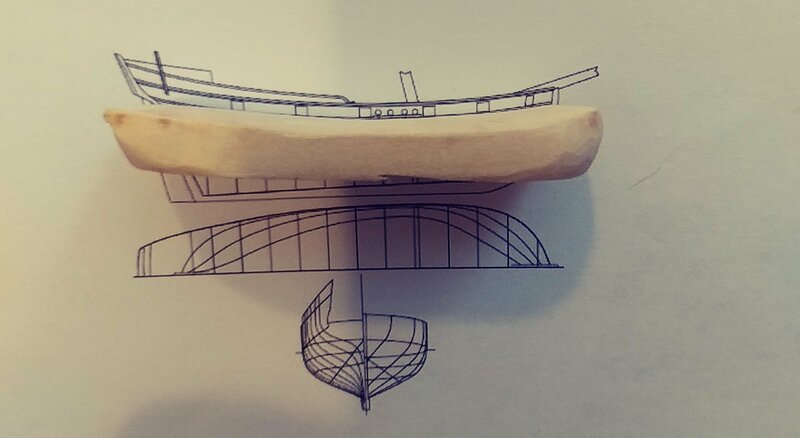 Once the hull was done I drew in the deck planking. There's a lot of methods to this too. I did it kind of quick so it isn't amazing but I'm not stressing it to much. Honestly a lot of the deck will be covered up with hatches, cannons and other parts so I wouldn't spend to much time on the deck planking. So that's where it's at. The bulwarks will be next. Let me know if you have questions. Thanks for the info. 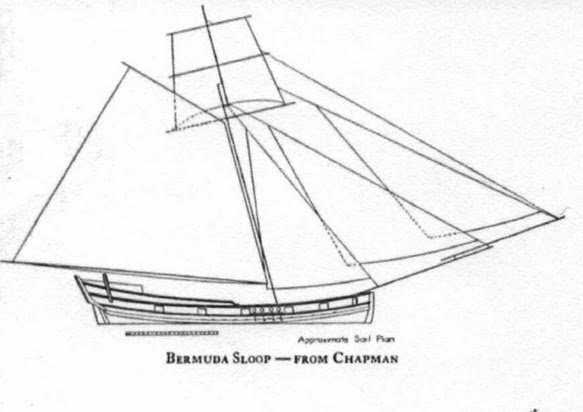 I had noticed that on the stamp of the Turks & Caicos Islands 10C ER 11 picture of an Bermuda Sloop that there was a sail that was taken in. It is between the mast and the inner jib. I assume that there are stud sails in your drawing as well. Again thanks for the info and I look forward to the rest of your build. You are correct there is a main square sail between the jobs and the fore and art sail. It also has stuns'ls. It's very simmilar to a cutter rig in that way which is probably what made them such fast ships. A few more photos and steps. Mark out where you want the gun ports. I eyeballed it. Probably not the best method but it was a quick way of doing it. After that its time to make the bulwark. 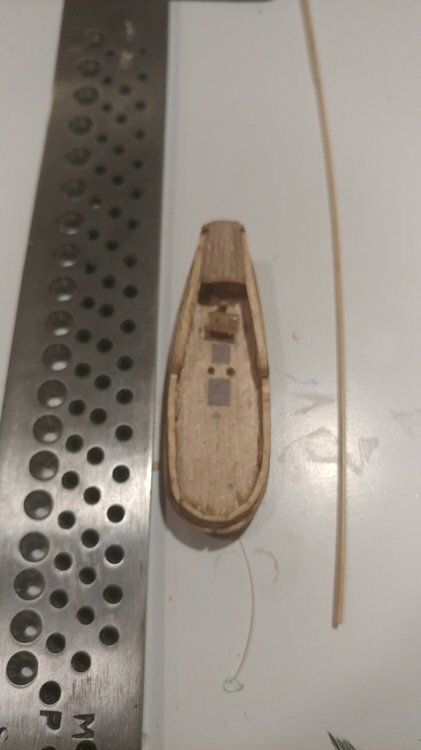 I used a 1mm or 1/8th inch piece of bass wood for the bulwarks. Hold them up to the plans and mark the width. At this point the cuts are straight even though the bulwark will be curved. 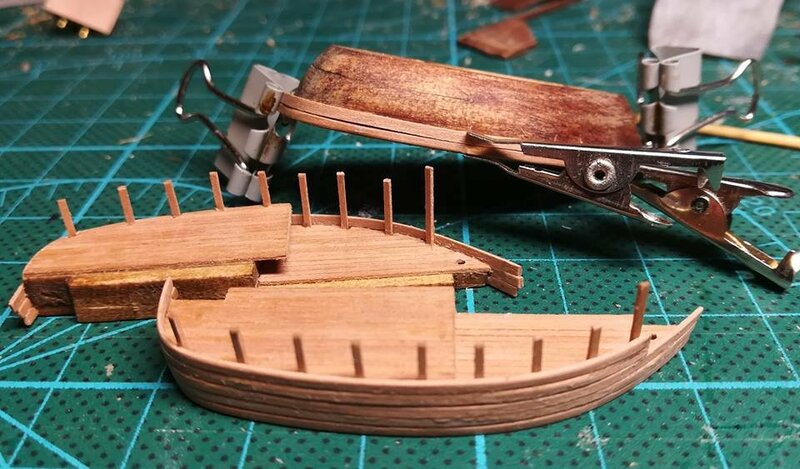 Cut the pice to be a little longer than the ship. 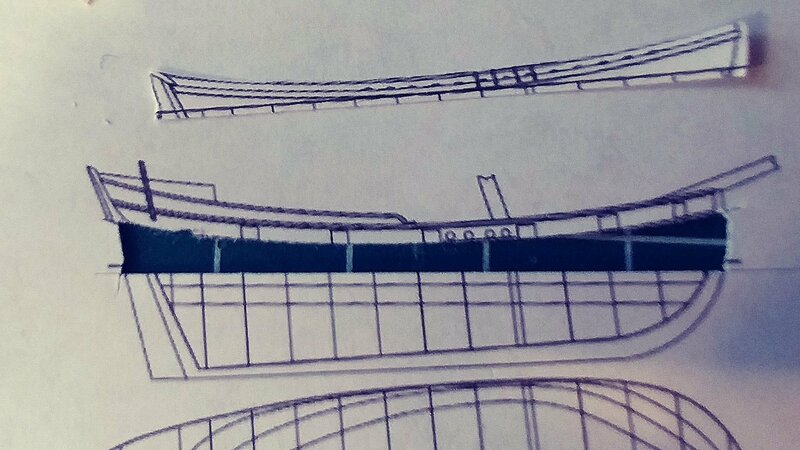 Remember the length of the bulwarks curves around the ship so its a little longer than the length on the plans. From here place the piece in a cup of hot water and let it soak for five minutes. This will help the wood bend. From here cut out the sections of the bulwark in between the gun ports. This way you don't have to bend the wood vertically just horizontially along the edge of the deck. It also makes nice square gun ports. For bending I use a technique called breaking the grain. You soak the wood then bend it with tweezers until you get a crease on the inside of the bulwark. 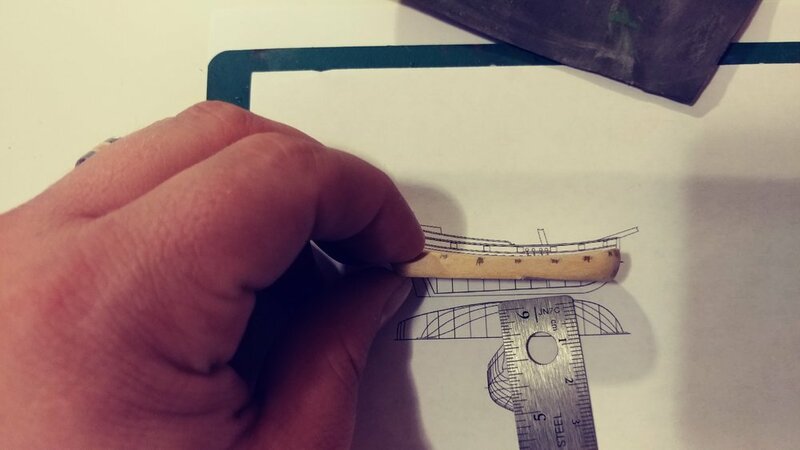 Do this along the bulwark piece and it will bend where you want it. The crease will be on the inside edge so no one will see it. Also glue oneside of the wood and let that dry then apply glue and bend the wood around gluing down the other side. The already glued edge will help it stay in place. Give the bulwark a good sanding then it's time for the cap rail. I cut this piece to be a little longer than the bulwarks are wide. In this case 1.5 mm. I soaked it and used the same bending techniques only this time going along the top of the bulwarks. Also note I didn't go all the way to the front. 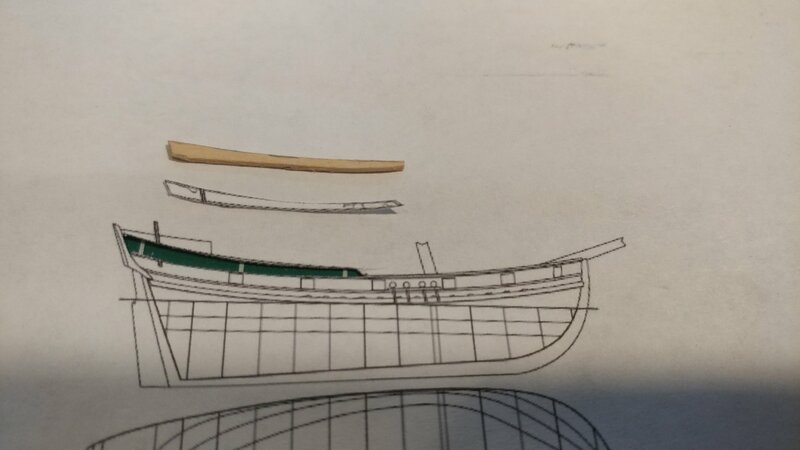 The bow bulwark have the tightest bend so I did a separate piece for this section. Also note the 1mm high bulwark are big for the plans. This falls into one of my rules for building. Cut big then sand small. Now that the rail is on the bulwarks it can be sanded thinner. 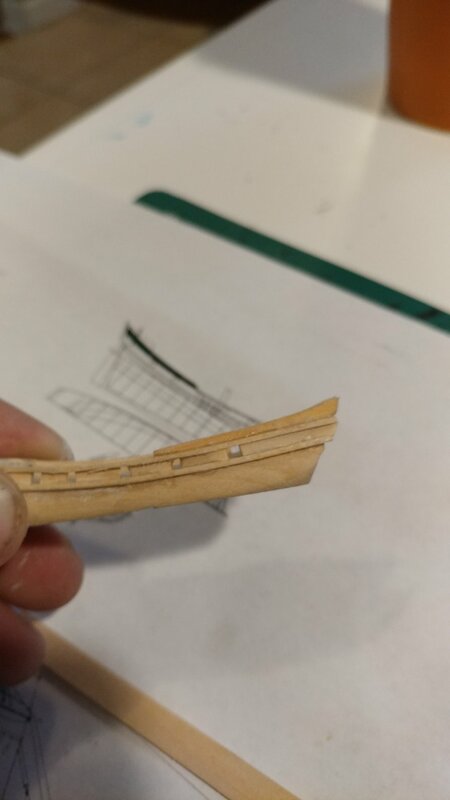 I cut another 1mm pice to act as a channel amd used the same technique to glue it right along the line where the bulwark meet the hull. This does a great job hiding the lines between the bulwarks and the hull. 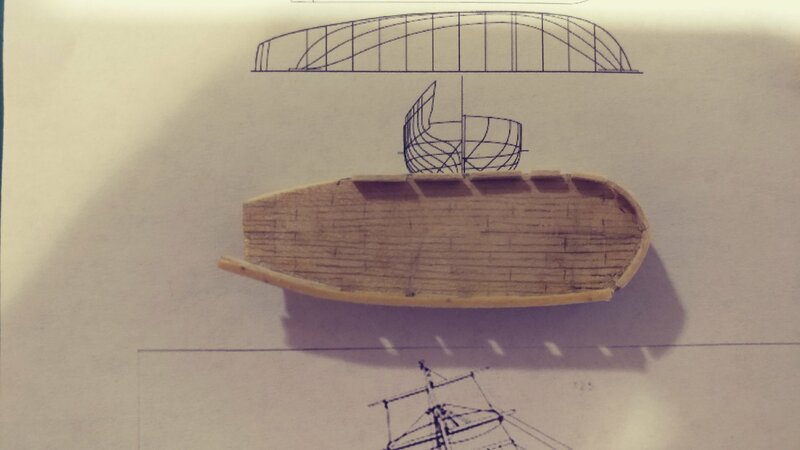 Its now starting to look like a bermuda sloop. 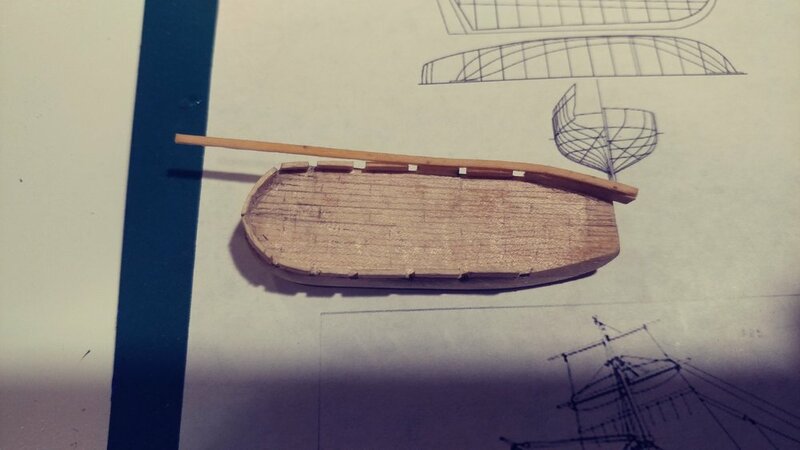 I take it your hull is NOT in two pieces, which will be pegged/glued together when the model is finished in the bottle . Nope it is not. This ship will sit in a clay sea so the bottom half of the hull is not needed. That is an option that could be done even with this method but I'm not doing it for this ship. Thanks for the info. Back to my drawing board. So the next part is adding on to the stern bulwarks. I cut out part of the plans to get the sizing that I needed and then cut out a piece of wood to glue in place. I soak the wood for a couple minutes and then glued it to the top of the bulwark. After I send the bulwark down I work on the rail to go on top of the stern bulwark. 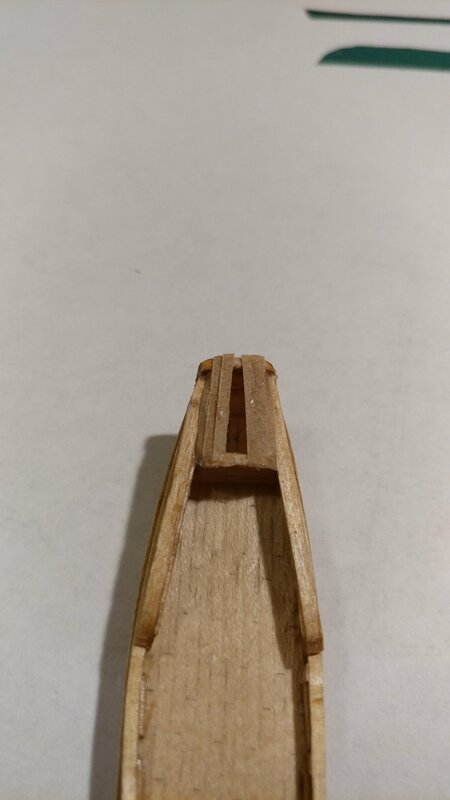 I cut out another 1.5 mm piece soak it for a a few minutes and then do a grain break at the very end to give that lip between the two rails. Then I glue it in place. 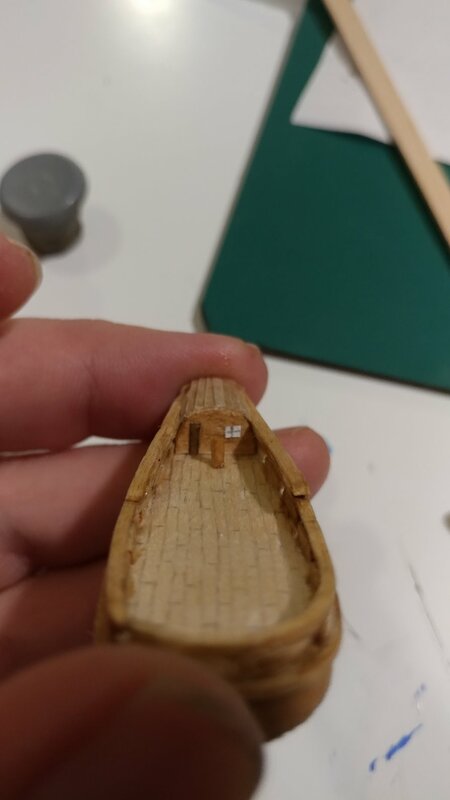 I send that piece down to thin it out and then move on to the stern cabin. 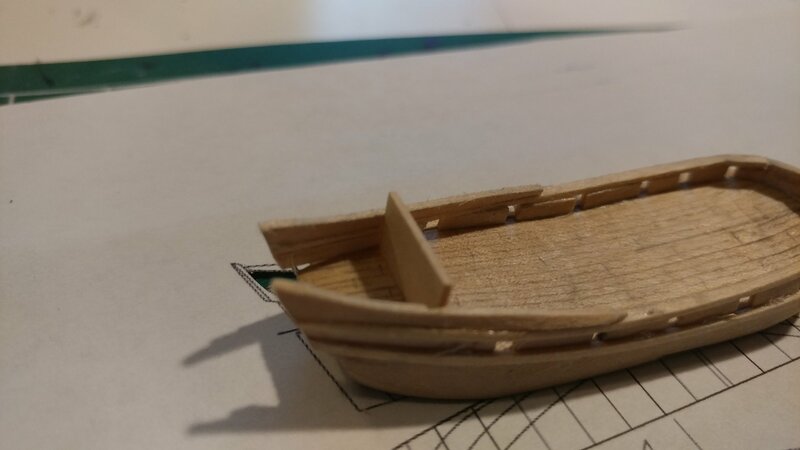 I start with the front of the cabin that will be on deck cut out a piece that fits in the place where the cabin will be and then sand the top edges to round it out. I decided to cut out the door on this model this is more for my own experimentation it doesn't have to be done as part of the beginners build. For the door typical I'd go out a piece of paper paint it and then glue it in place I wanted to try this out since the cabin is open and I will glue the door hinged open so that it looks like you can walk inside. After the front of the cabin was placed I put in the back of the cabin this is kind of the same thing placing the piece sanding off the top edges to round them out and gluing it on. I was able to get some more work done on this project but ran into a snag. 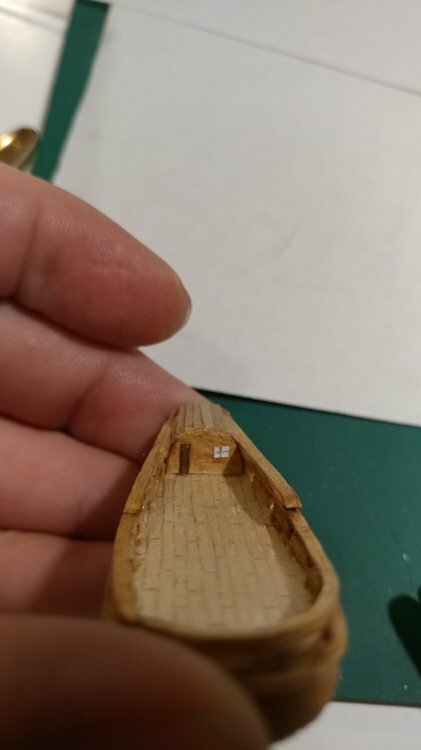 I grabbed the wrong stain and stained my ship darker than I wanted. So I made a second one. It works because theres two different methods I could use for rigging the main sail so now I can show both. This is the first one. 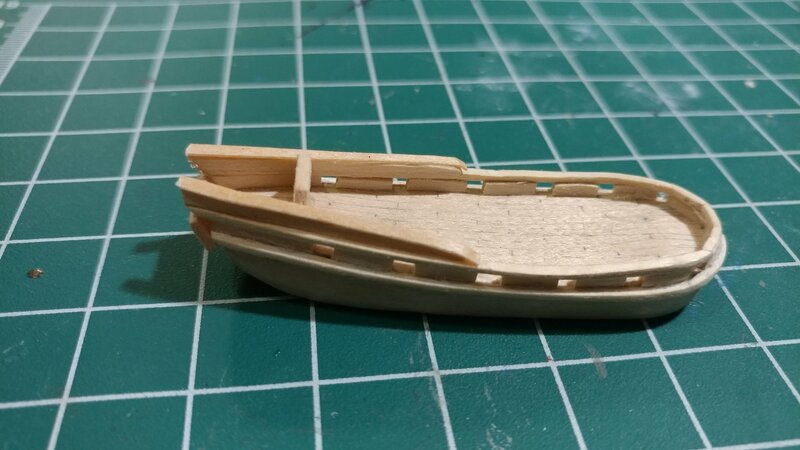 The transom is completed and I added the roof on the stern cabin. 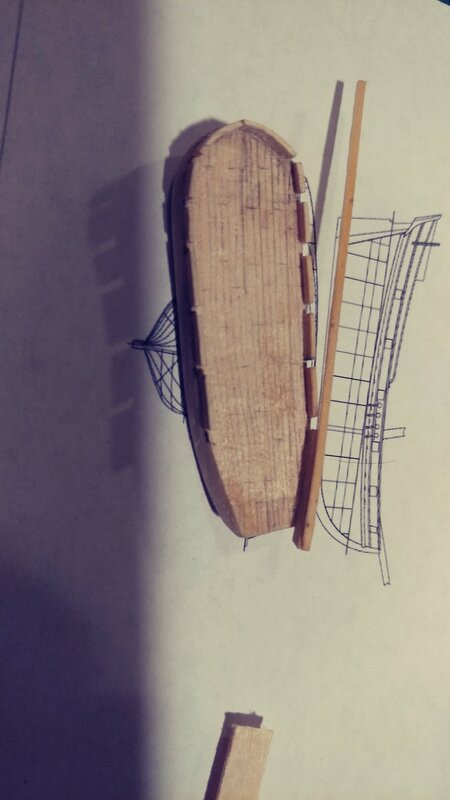 For this ship I used a piece of paper cut to size and glued on. After doing so I can't say I recemend that method. The paper bends funny and can leave weird divots in the roof. Instead cut out one millimeter planks and plank the roof just as it would have been done. This will cut out the divots and look more accurate. Its more tedious but I think worth the time. The second ship is not far behind. I will get the transome and roof on and then its time to start on deck furniture. The planking method works well and I think it looks good. 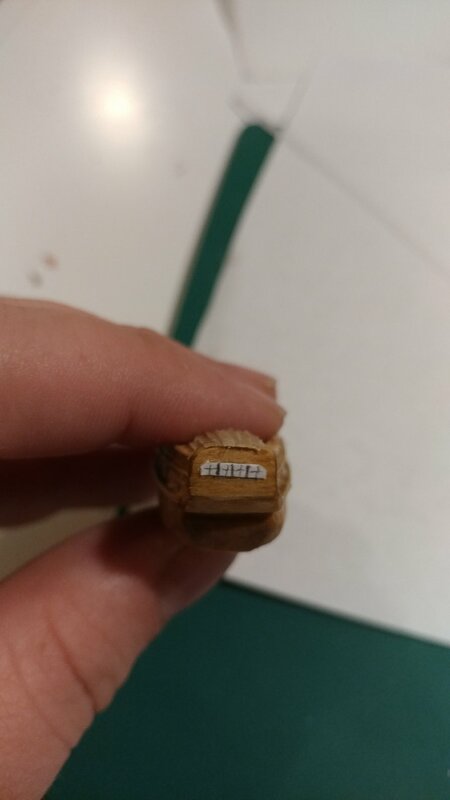 I cut some paper at 1.5 mm stained it with golden oak and glued it in place. I started from the outside edges and worked in. 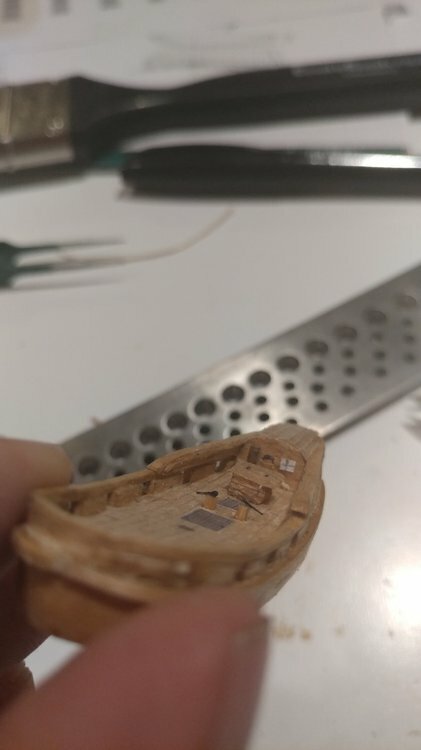 I also stained the hull with golden oak. From there I did the windows. 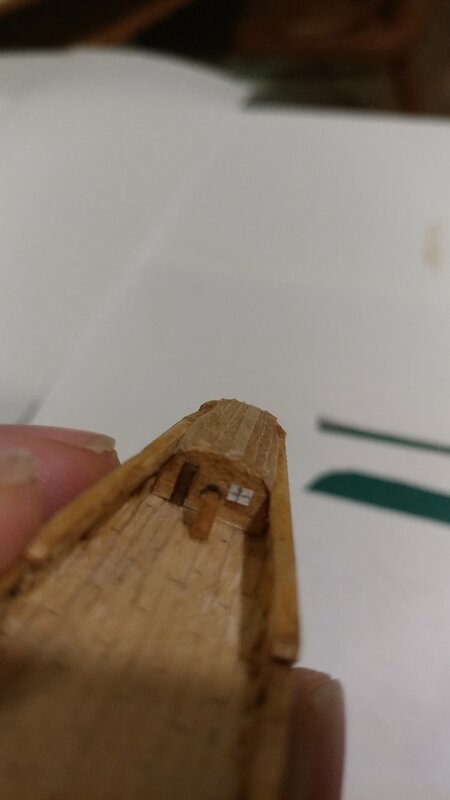 One of the best ways to do windows is to print off windows from plans and glue them onto the model. My printers down at the moment so I hand drew some windows. I took a darker stain and stained a strip of paper for the door. Now for some deck furniture. Before I start I'd like to point out that the technique I use I learned from John Fox III. He told me to break down the objects into their individual shapes. For instance when you look at a cannon the main shapes are a cylinder that sits on a rectangular box. 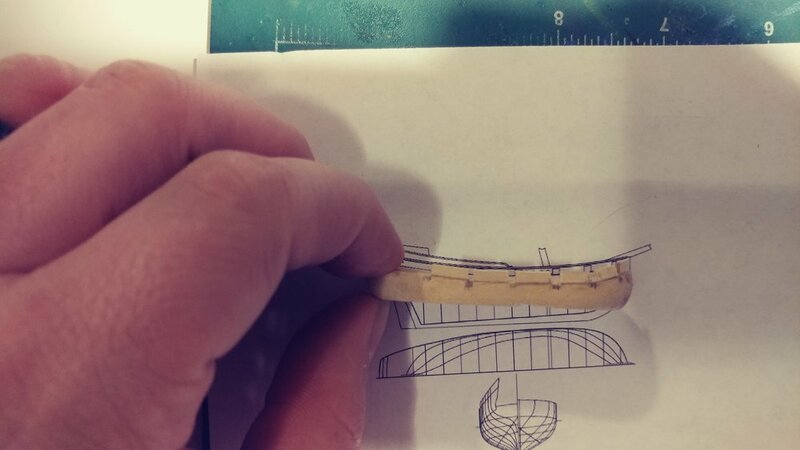 By breaking down the shapes of objects it makes them easier to model at a small scale. One other note. One thing I do starting out with deck furniture is mark where the mast is going. You don't want to put a hatch or a deck house right where the mast is supposed to be. 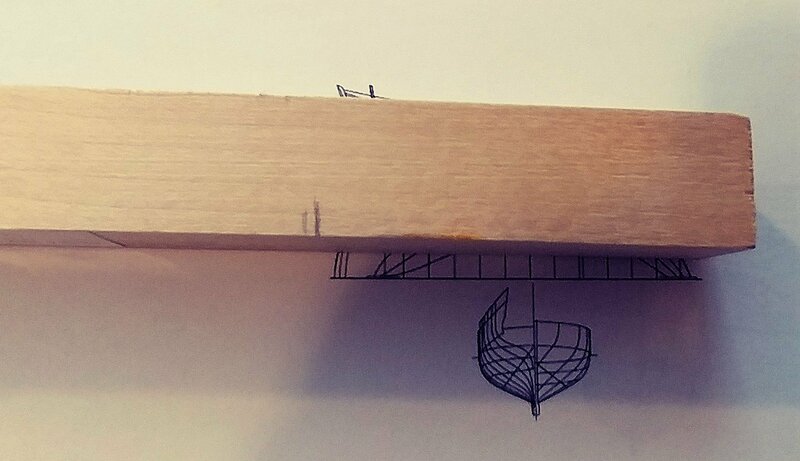 So I put a small pencil mark where the mast will be. The first piece I'll work on for this ship is the helm. Breaking down the shapes for this helm, it will have a rectangular box that holds the helm and a circular object that is the helm. The box is easy enough I cut a piece of wood into a tiny box that fits the size I want and glue it in place. The circular piece it harder. It's hard to get circles small enough to fit the scale. 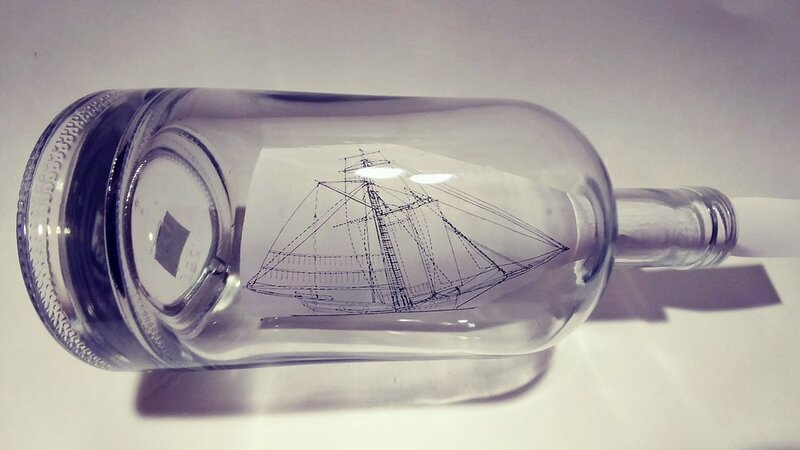 One of the great techniques of ship in bottle building though is to use found objects that fit the pieces you need. Just as old sailors used bottles and wood scraps that were otherwise garbage on the ship, there is often objects lying around that can work for ships in bottles. One technique I like a lot for helms is going down to the watch repair store and asking for spare gears. Watch gears make very good helms. We'll cover found objects more when I get to the cannons. 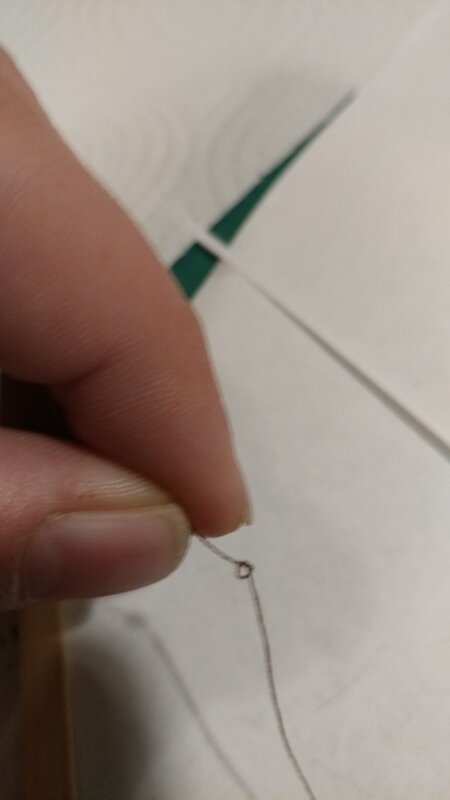 If you don't have access to a watch store there is another method that can be done with string. Take a piece of string and tie loose knot. 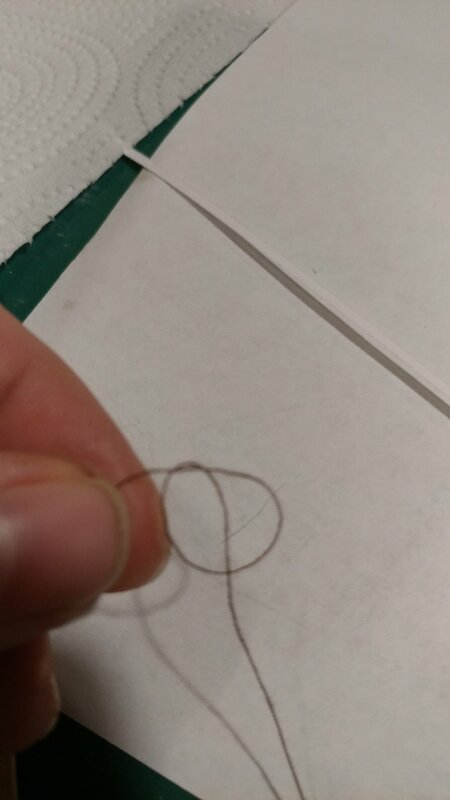 Then slowly tighten that knot into a loop that is the size of the helm. Glue it down and trim off the edges. 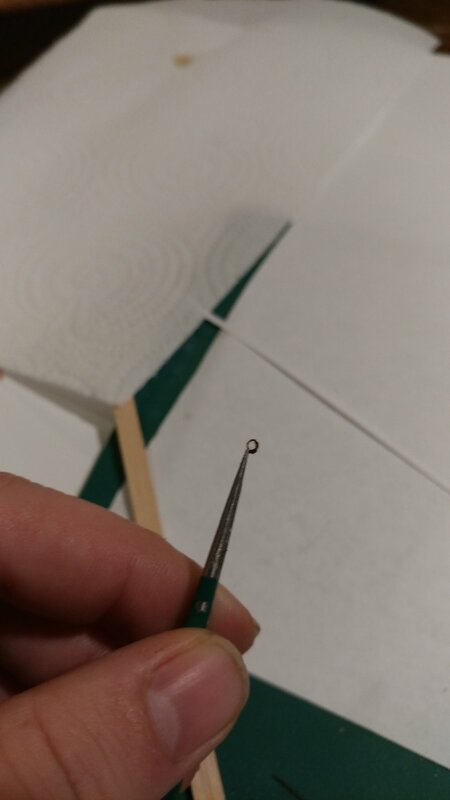 Any left over edges glue into the circle so you have a nice round piece of string. Then the piece of string is glued on to the rectangular box that holds up the helm. One thing to keep in mind is you don't need a perfect helm. With the location and size chances are no one will even notice how the helm is modeled. 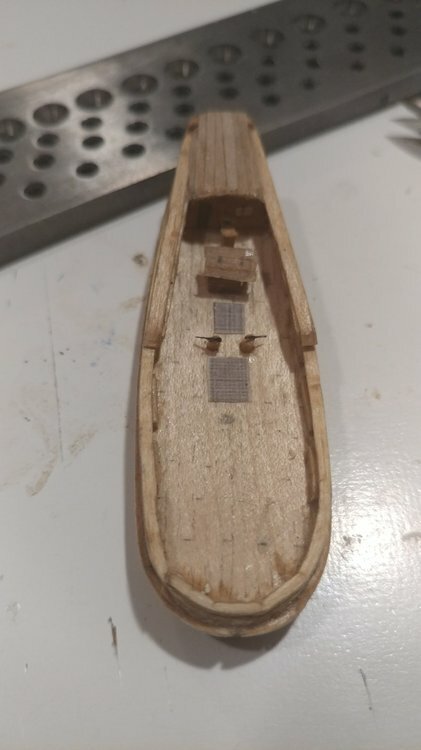 When it comes to modeling ships this size the details can be left out. Often I find the mind has a way of recognizing the shapes and filling in the details. So how far you take those details is up to you. Personally I like the challenge. In reality you could glue in the rectangular box with no helm and chances are no one would know the difference. Moving forward I modeled a small deck house. It's more of a raised hatch on this ship. 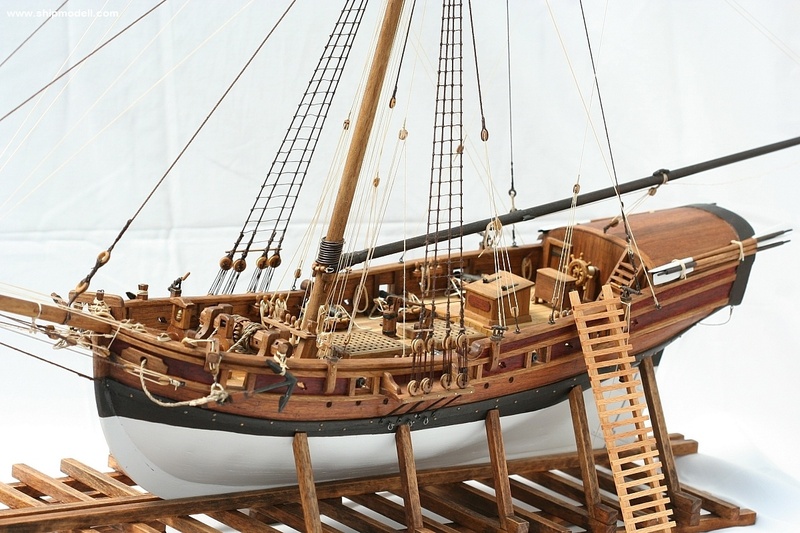 The picture below is a good example of what this looks like and the Bermuda sloop deck in general. The hatch just forward of the helm is made up of a box with a tilted top. This top stick out over the edges slightly. So to model it I cut a piece of wood into a box, sand the top down and glue on some paper strips on top. 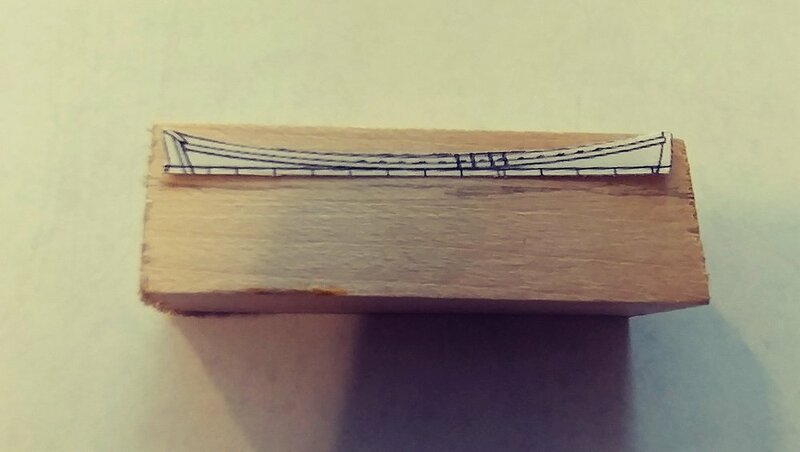 Then with a pencil I made a mark for the hinges. Looking at this photo know I think I have the helm in the wrong place. All well it's already glued in. Another important tip. You are the captain of this ship and things go where you want them to go. You can follow my instructions or do it your own way. What ever makes you the captain the happiest with your work. After the deck house I put in a couple hatches. I can't remember if this is a Jim Goodwin technique or a Greg Alvey technique. I learned it from one of them. Any way, first I find some plans for hatches. I googled it and found some that I pasted into word and copied and resized the photo to a lot of various sizes. 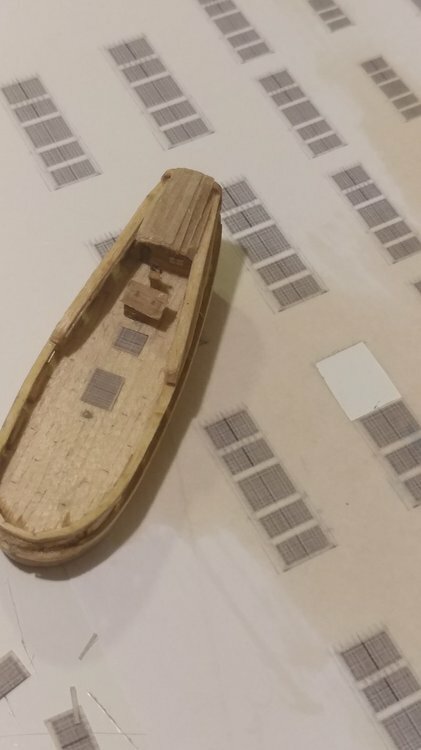 With the varied sizes I can makes hatches for a variety of ships by printing one page of hatches. The word file I used for this ship is attached. Once I have the hatches printed I turn the page over and lightly stain the back of the page. That way the ink doesn't run. The wood stain gives it a wood color and the ink makes it look like a hatch. Then I cut out the hatch and glue it on the hull. For this I use white glue. This allows me plenty of time to put the hatch in position. If you use super glue and the hatch goes down crooked it becomes a big mess. Great work Daniel, thanks for putting together this tutorial. It's nice to follow along "in real time" to see the steps in action. 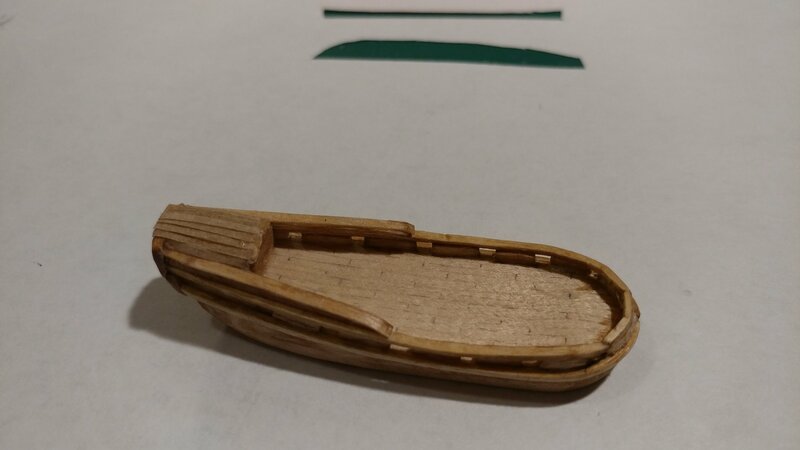 One question - I see how you carved the lower hull from the deck level down. For the bulwarks, do you just glue the strip on top of the lower hull/deck? Or do you glue it to the side of the hull, and then sand it at the connection so that it feathers into the lower hull? I decided to redo my Challenge because the bulwarks ended up being non-existent. 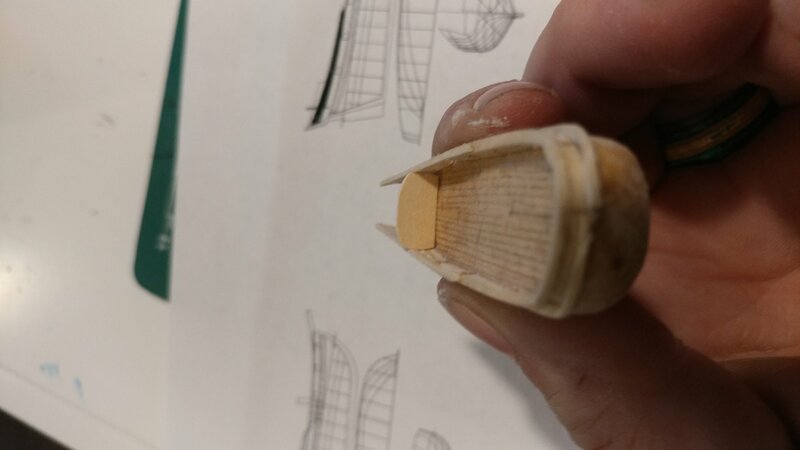 I carved a second hull, this time carving the upper hull with the bulwarks in one piece. 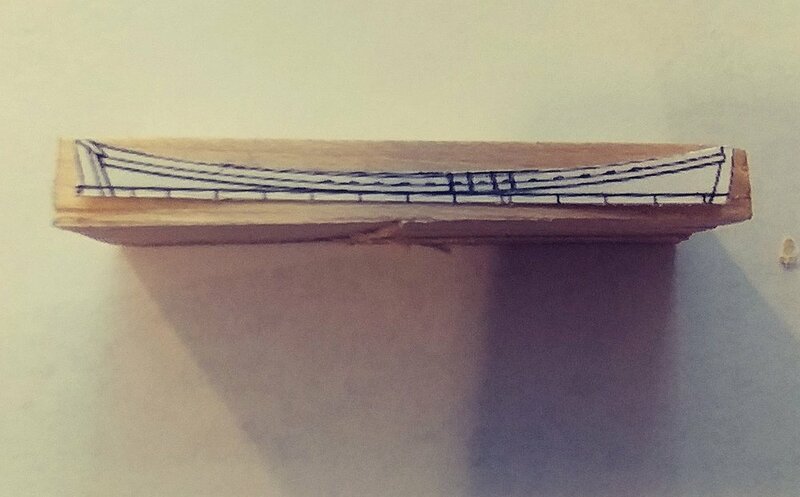 On my first attempt, I used 0.4mm plywood and feathered it in. The problem I found was that in trying to glue it, being so thin the plywood almost got like wet paper and lost integrity. I wasn't sure about creating the bulwarks by gluing a strip directly on top of the lower hull, but that seems to work out really nicely. I often use the method of building bulwarks from planks. Usually I use planks made from a pear or hornbeam 0.5 mm thick. I glue them with TiteBond glue. Then I put the racks on the inside of the bulwark. And then I can process the outside of the bulwark with sandpaper to make it thinner. Hi Igor thanks so much for that explanation. 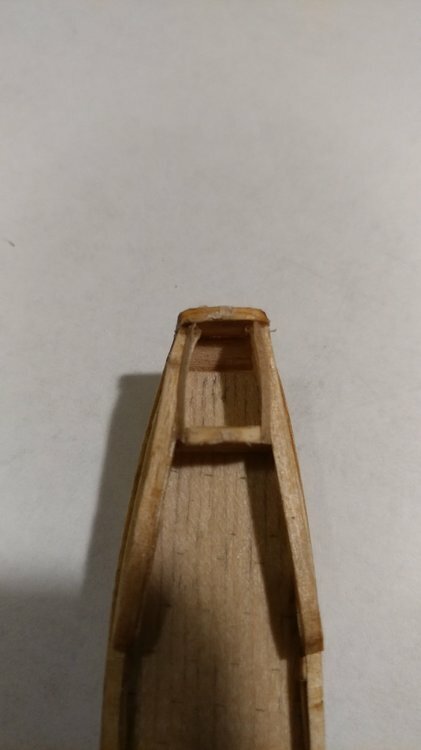 It sounds like you glue the bottom edge of the 0.5mm plank to the top of the hull? 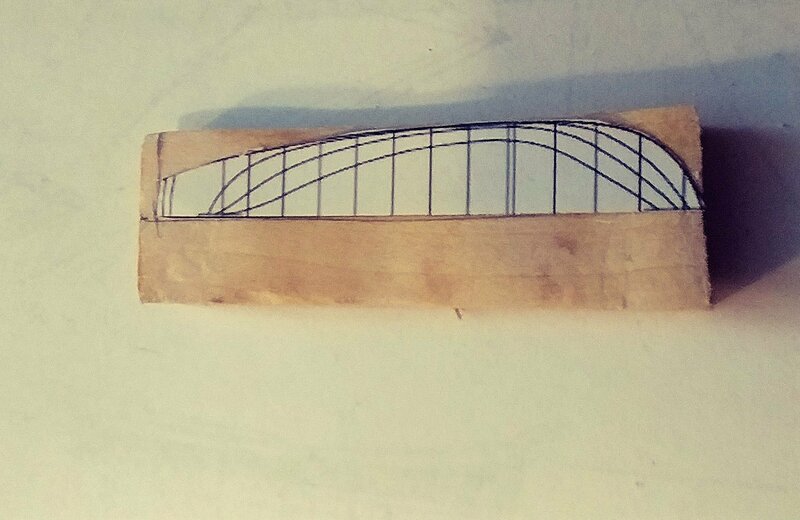 How do you ensure it keeps the curve without using pins along the edges of the curve? 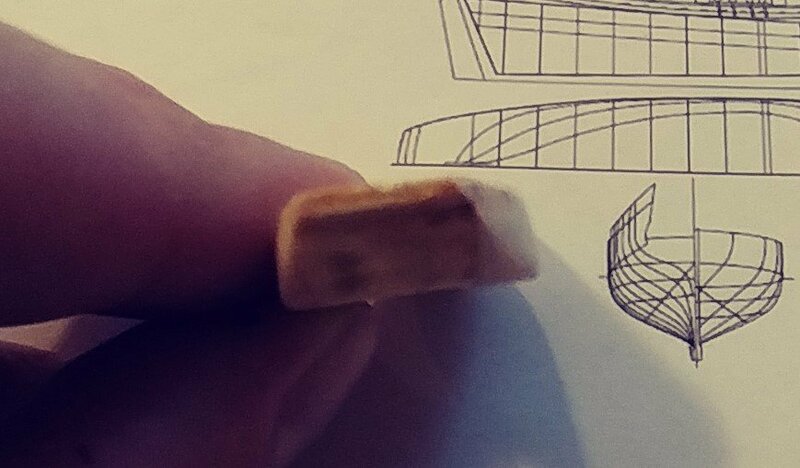 Or are you saying as you plank the hull, you let the top planks extend above the hull to form the bulwarks? Also, can you explain what you mean by “racks”? It’s probably a translation but I’m not sure I understand what you mean. 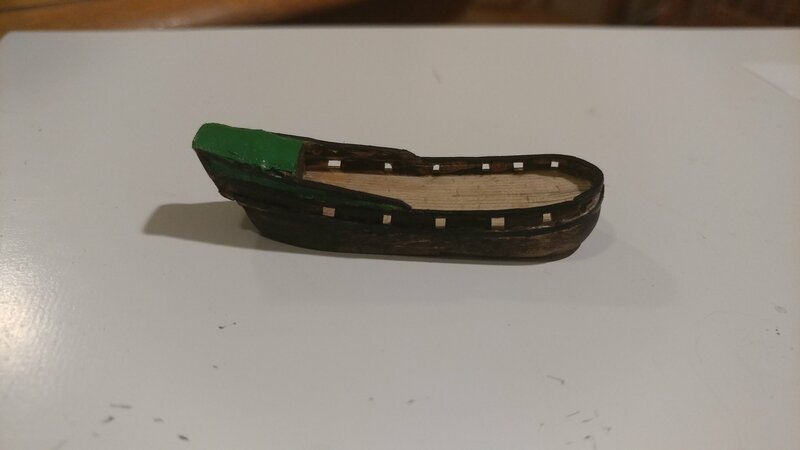 Mike - I glue them to the top of the hull. Give it a very tiny over hang and sand flush to make it nice and even but I do glue them on top. I got the idea looking at Chucks sloop Cheerful on MSW. At one point he has the bulwarks on with no caprails so the gun ports were open on the top. 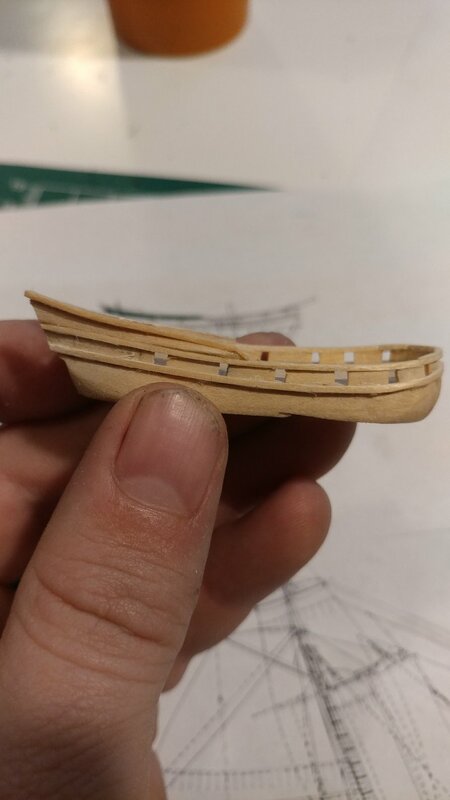 Before this I would carve down into the hull leaving the edges for bulwarks. This was often uneven and caused problems when carving out the gun ports. Glueing in each piece individually makes for nice even and consistent gun ports and bulwarks. The channels and rails added after help the overall structure of it so its nice and solid. 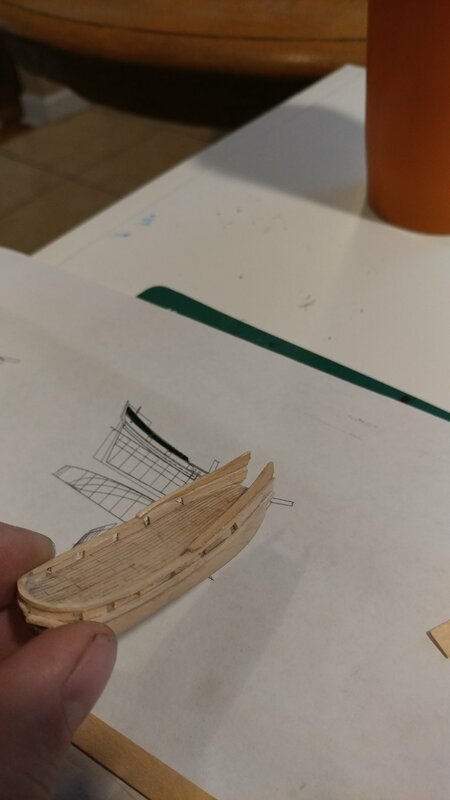 Usually I cover all the parts of the base of the hull with planks. Please, look at this photo of one of my current projects. Thanks Igor, I was thinking that's what you meant. At least on my 1:64 scale Charles Morgan build, I think those upright pieces are called "stanchions." I'm amazed that you are able to add actual construction details at such a small scale! Time to add in the bilge pumps. Basically this piece. Breaking this down its a cylinder with a handle on top. First I drilled a couple holes. That ensures they aren't going anywhere. I like to use booboo scewers on round objects particularly masts and yards. Its a sturdy material and it works well pulling through a draw plate. 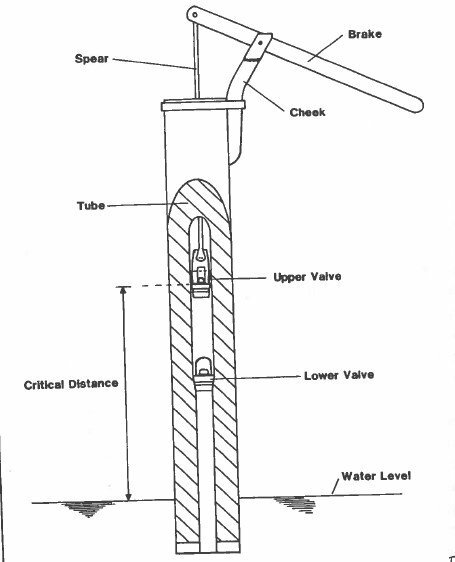 Another great method is putting the scewer into a drill and turning it until its smaller. I don't suggest turning in a Dremel though. Dremels turn to fast which makes bamboo into a projectile. Drills are slower and more controlled. Once I have the skewers whittled down I cut off a piece and glue it in making sure they are the right hieght. The handle I make out of a paint brush bristle. Its thin and stays straight. A little black paint gives it a good look. Glue it on at an angle to look like the handle is sitting at rest.